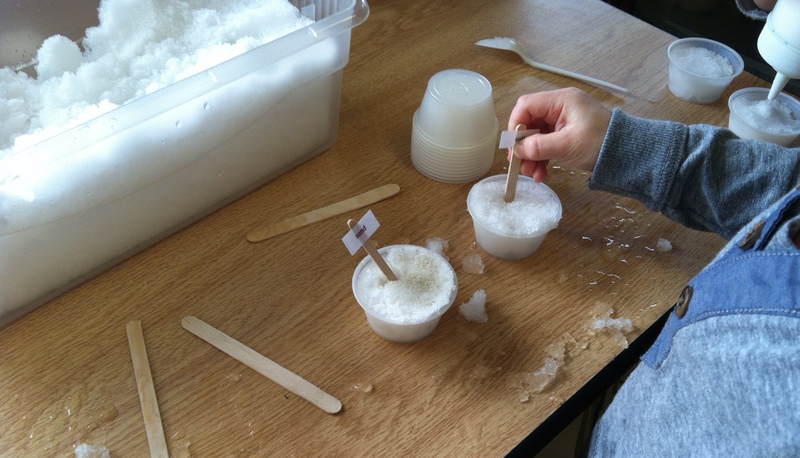 After a recent snowfall, my class ran some experiments with snow, salt, and sand. Science experiments have been prevalent in my classroom for many years. But until recently, most of them we carried out as large-group, teacher-led activities. I redesigned my science center this year, hoping to give children more opportunities to set up their own experiments. 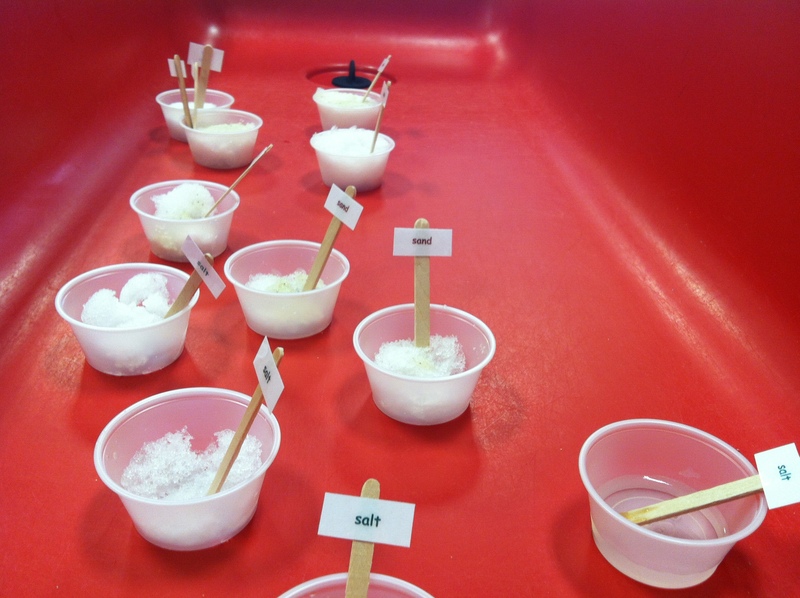 Many students came with some prior knowledge about what salt does to snow and ice. We live in Chicago after all; snowplows are a familiar sight. I challenged some assumptions, however. I asked, “Are you sure? How do you know?” As a group we briefly talked about how experiments can help us see if something is true, and also help us learn new truths. My instructions were somewhat vague: fill two containers with snow, do something different to the two containers, and then watch what happens. I wanted children to make their own decisions about what to compare. I expected that we’d end up with a wide variety of arrangements, and we did. Things did not go quite as I had planned. (They rarely do.) 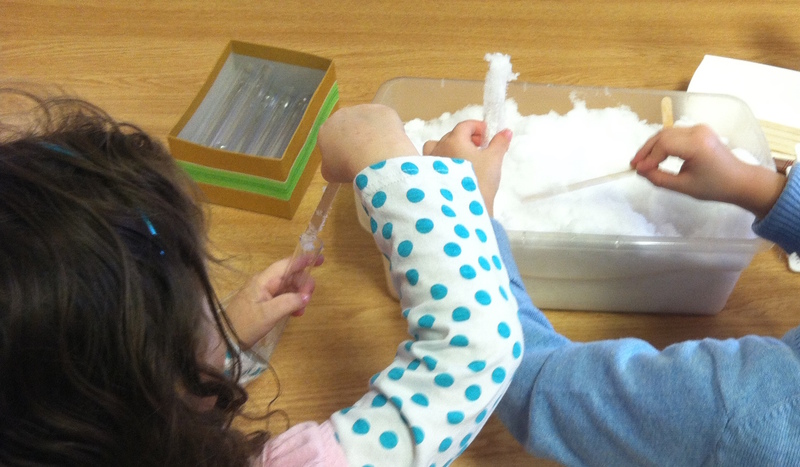 At first, I had children filling small plastic test tubes with snow. I reasoned that it would be easiest to observe our results in test tubes, on a rack. But it was pretty difficult for the children to get snow into the small tubes. They became frustrated. On day two, I adjusted by setting out little round containers instead. It was harder to tell how much snow had melted, but students were able to set up their experiments much more independently. Another hiccup: children had trouble distinguishing between words on the tiny signs. 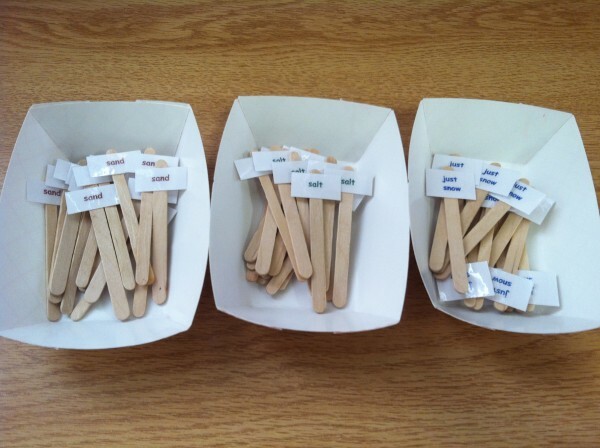 I knew this would be a challenge, but I also thought it would be a nice way to incorporate functional reading skills into a fun activity. Alas, the words ‘snow,’ ‘salt,’ and ‘sand’ were too similar for most students to distinguish without significant support, which distracted them from main goals of the activity. I should have included tiny pictures of saltshakers, sandy beaches, and snowflakes. Also, many students disregarded the word ‘just’ and placed ‘just snow’ signs in each of their containers. 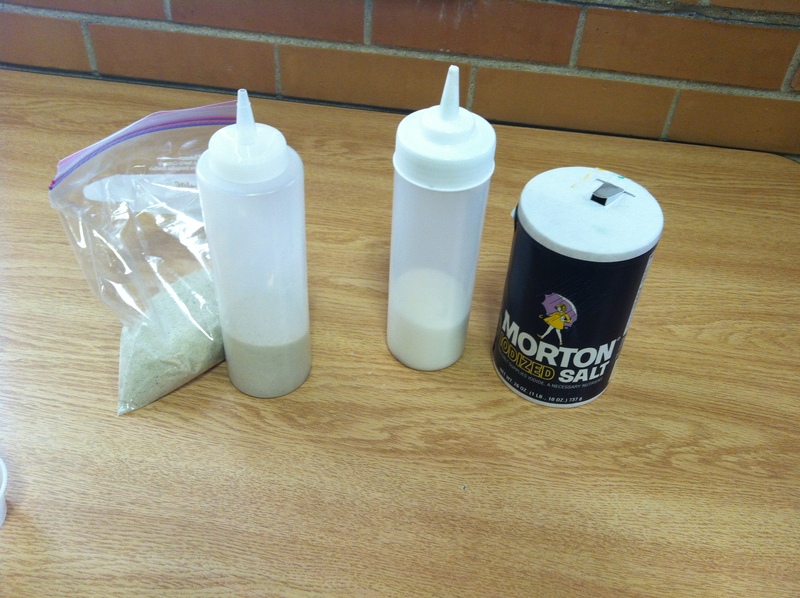 As a result, most containers were labeled as ‘just snow,’ even if they contained salt or sand, and I ran out of ‘just snow’ labels. Perhaps the toughest challenge in designing activities for my new science center has been anticipating which minutiae have to be in place for an activity to succeed. It’s hard to think like a young child—it’s a big part of my job—and I’ve learned to expect that I’ll overlook some notable detail each time I roll out a new activity. Although things didn’t go as smoothly as I had hoped, this was a successful activity. Students were able to set up experiments independently, they were highly engaged, and they had fun. We ended up with more “salt and snow” conditions than any other type, probably because it’s more fun to add more ingredients. The experimental conditions were not very well controlled, of course—nothing was precise. 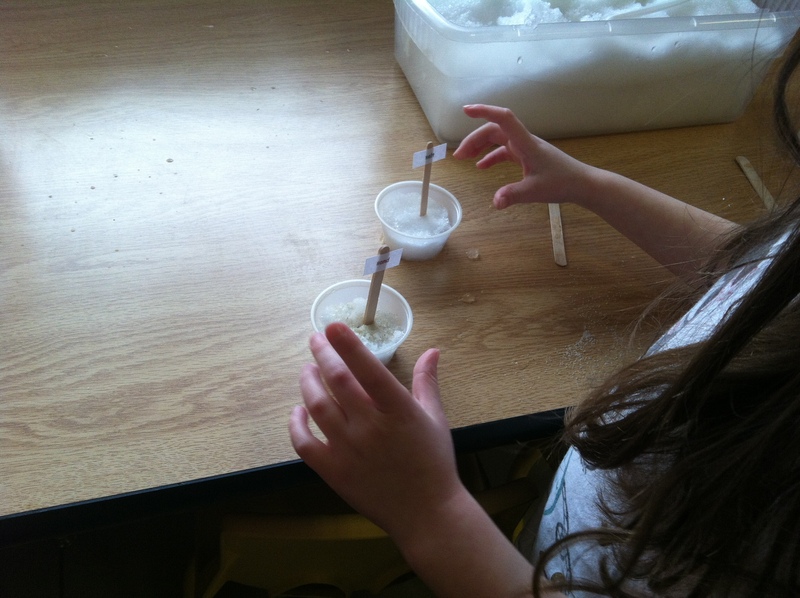 Still, most students walked away convinced that salt melts snow, and uncertain about the effects of sand. When students disagreed about their results, I used it as an opportunity to talk about the commonality of disagreement among scientists. Most importantly, we saw how a simple comparative experiment can help us learn about the world around us. The scientific method, in its simplest form, is accessible to young children. All it takes is a little bit of scaffolding.